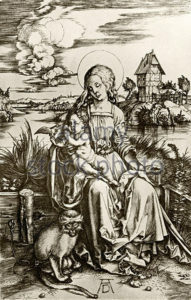 This year’s Artemis Journal features our guest writer, Ron Smith with several poems and today’s post highlights, Virgin & Child with Monkey, in which he used an engraving by Albrecht Durer, c 1498 to inspire his Ekphrastic Poem. (Ekphrastic poetry is a poem inspired by a work of art). to ask or ask for. bite a plug out of my flesh. The child leans out of your lap. to live in the air. roughly those of a man. Ron Smith was appointed Virginia Poet Laureate of Virginia, the highest honor that can be bestowed upon a writer in our state. This recognition comes to him after many well-received publications. He is the author of Running Again in Hollywood Cemetery, Moon Road, and Its Ghostly Workshop. Ron is also the first Writer-In-Residence at St. Christopher’s School in Richmond, Virginia. In addition to this, he is the former president of the Poetry society of Virginia and sits on the advisory board of James River Writers. We are grateful to include him in the Artemis Journal 2016. Albrecht Dürer is the greatest exponent of Northern European Renaissance art. While an important painter, in his own day Dürer was renowned foremost for his graphic works. Artists across Europe admired and copied Dürer’s innovative and powerful prints, ranging from religious and mythological scenes, to maps and exotic animals. Technically, Dürer’s prints are exemplary for their detail and precision. The son of a goldsmith, Dürer was trained as a metalworker at a young age. He applied the same meticulous, exacting methods required in this delicate work to his woodcuts and engravings, notably the Four Horsemen of his Apocalypse series (1498), and his Knight, Death and Devil (1513). Dürer was also a great admirer of Leonardo da Vinci. He was intrigued by the Italian master’s studies of the human figure, and after 1506 applied and adapted Leonardo’s proportions to his own figures, as is evident in his drawings. Later in his life, in the 1520’s, he illustrated and wrote theoretical treatises instructing artists in perspective and proportion. Virginia’s poet laureate, Ron Smith, will help launch this year’s Artemis journal on Friday at the Taubman Museum of Art with what he describes as a “discreading” or “readcussion.” He plans to read some of his poems, talk about them, as well as poetry in general, and then take questions, which is usually his “favorite part of such an event,” he said. The event celebrates the 23rd edition of the Roanoke Valley literary journal Artemis, which began in 1977. Jeri Rogers returns as editor, with Virginia Lepley as design and art editor, Maurice Ferguson as literary editor and Jonathan Rogers as board adviser. Smith is this year’s guest writer, and Roanoke sculptor Betty Branch is guest artist. 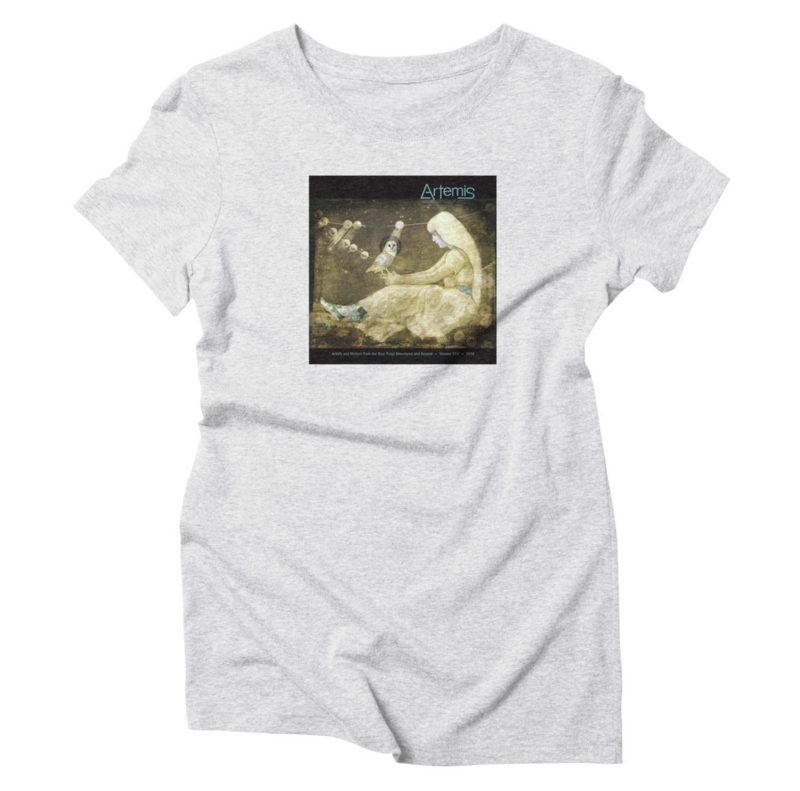 The mission of the journal, named for the Greek moon goddess, is to foster excellence in art and literature in the Blue Ridge Mountains and beyond. It strives to provide an outlet for first-time contributors to debut their work alongside professional artists and writers. Friday’s event will begin with a wine and cheese reception in honor of Branch at 6:30 p.m. The sculptor has a long history with the journal, having served on its board and having been a featured artist within the journal’s pages. Branch’s work will be on display in the museum. We sat down with the 67-year-old poet and asked him about his process, where he gets his inspiration and any advice he has for budding poets. The Roanoke Times: How did you get into poetry? RT: How did you become Virginia’s poet laureate? RS: Part of the process is extremely mysterious. For some reason, I ended up on the Poetry Society of Virginia ballot with other poets, and then the members gave me a lot of votes. Next step was that the top three vote-getters sent poems and bios to the governor’s office. Finally, I was appointed, appointed officially (and possibly picked literally?) by the governor himself. RT: Where do you draw inspiration for your writing? RS: Everywhere. Everything sends me to my note pad or my computer. An odd phrase spoken by my granddaughter, the color of the evening sky, a quirky detail in a biography, my cat’s congested purring sound. You name it. RT: What is your writing process? RS: I write all day long, at least in little spurts. And I write every day. I am addicted to converting sights and sounds and smells into words, to twisting everyday language into new and more interesting shapes. Memories, movies, songs, silliness, lingering fears, languishing ideas — everything makes me want to write. When I travel, I write about new places. When I stay home, I write about home. RT: What is your favorite part of writing? RS: Starting a new poem is usually a blast. Finishing is usually the least enjoyable part. Having the poem twist out of my grasp and run off into the woods — that’s also a wonderful moment. When the poem takes off in a direction I never foresaw — that’s what I hope for every time. I’m writing to discover what I think, writing to find out what the language can achieve. RT: What is the best advice you can give to aspiring poets? RS: Keep doing it only because you love doing it. Keep doing it because it’s what makes you feel most alive. Remember that writing is an adventure into language and psychology and sensory information. Keep pushing back the dark — which is to say your personal dark. Do not try to write for all readers. Write the best stuff you can every time you write. Don’t do mere exercises. Life is short. Think like Herman Melville: “Go for broke in every sentence.” Don’t worry about making mistakes. Think of every poem as an experiment, OK, but an experiment in which you are digging up an important truth about what it means to be a human being.